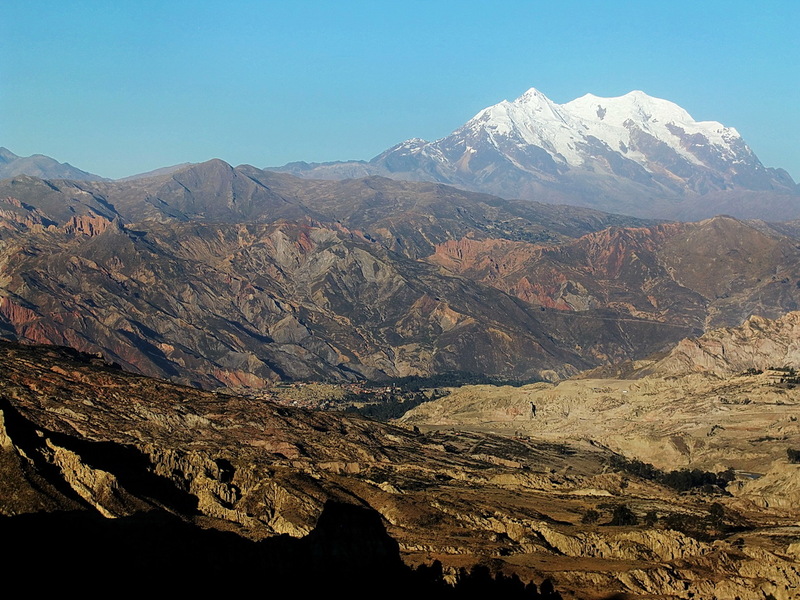 Potosi is with more than 120,000 inhabitants the highest city of our world at 4100 meters sea level. Potosi was the richest town on earth due to enormous silver findings in the mines of the mountain Cerro Rico. The exploitation of silver started already in the 16th century and it was shipped mainly to Europe. But the silver was a curse for the local people, many died in the mines due to inhuman working conditions. Now the silver is gone, but tin and zinc are mined nowadays. 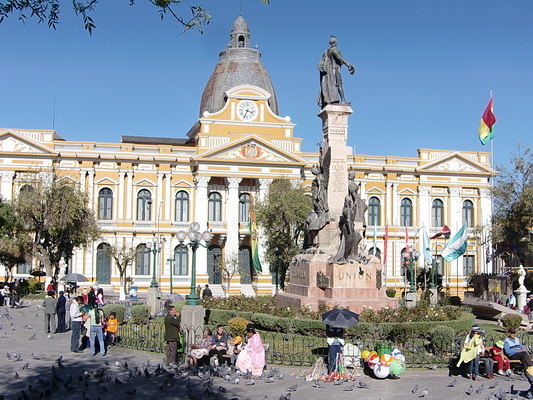 La Paz is with more than 2,000,000 people the largest city of Bolivia, its economical heart and its seat of government. It is beautifully situated in different valleys of the Altiplano between 3200 and 4100 meters surrounded by very high and white mountains. 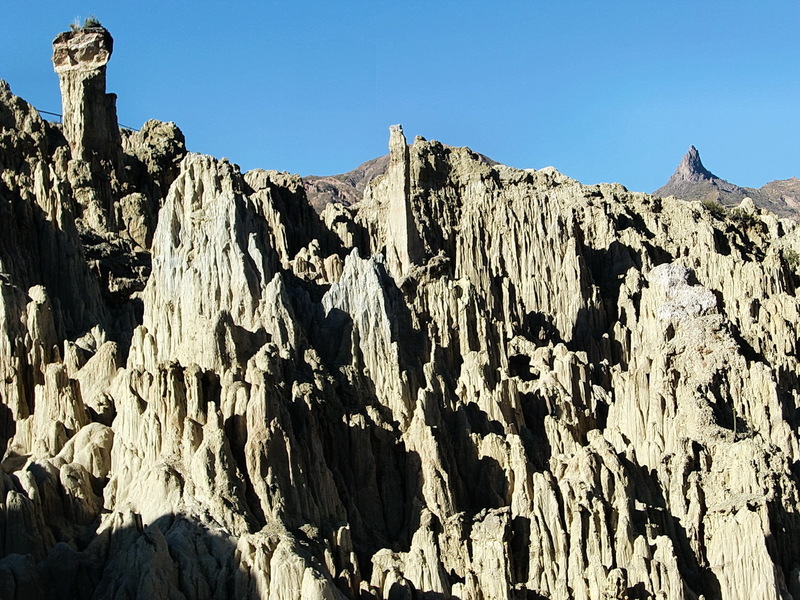 Famous are the various markets of La Paz, a lot of nice places and the Valle de Luna (moon valley) with stunning earth pinnacles. 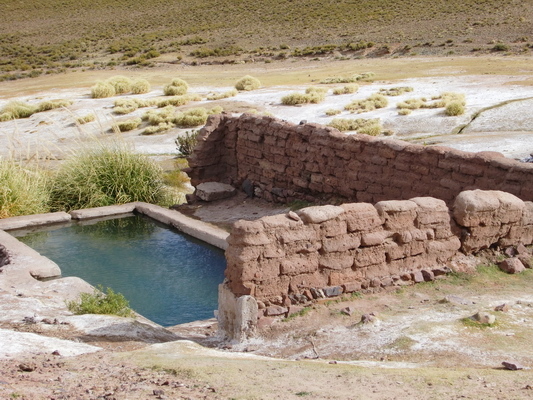 We left Uyuni on June 1st 2011 to the village of Ticatica with some hot springs. 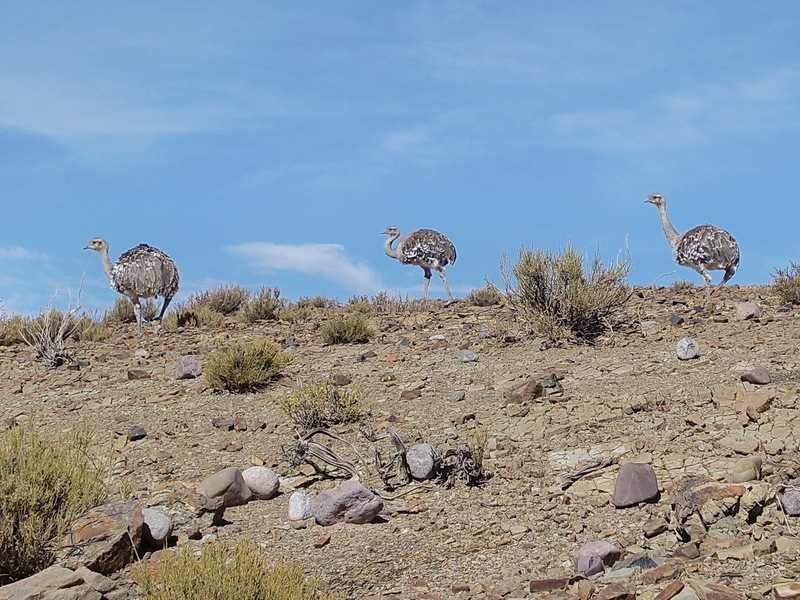 We saw Rheas close to the road to Ticatica. The hot springs of Ticatica are 12 km away from the tarred main road in a side valley. 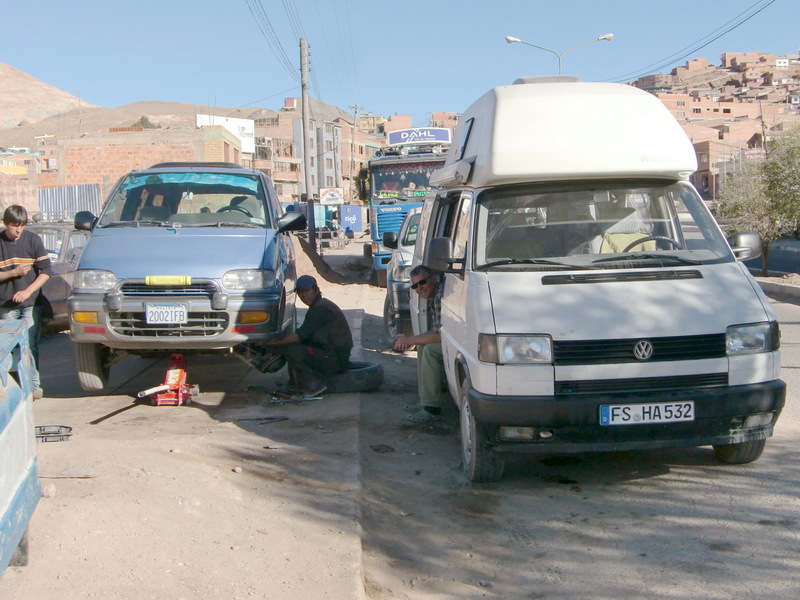 We walked the last 2 km, because the road became too rough for our VW California. The hot springs were in little bit shabby and dirty conditions, only one basin was looking acceptable. We dared to jump in and we enjoyed the hot water deeply. We were totally alone in a pristine environment. 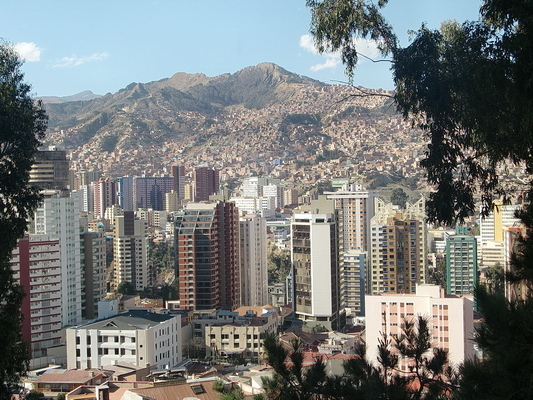 Potosi claims to be the highest city in the world. 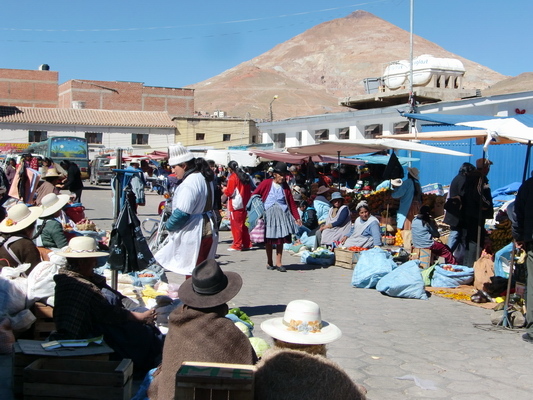 It is situated at 4100 meters sea level on the foot of the Cerro Rico. The Spaniards discovered silver in the Cerro Rico in the year 1547. They exploited the silver soon; Potosi had more than 100,000 inhabitants and was the richest and largest town of America few years later. But the mountain was a curse for the native people; most were forced by the Spaniards to work in the silver mines under merciless and inhuman conditions. Potosi was the treasury of the world, especially of Europe and the Catholic Church. Now the silver is gone, but still zinc and tin are exploited. Today Potosi is an interesting city with two faces: On the one hand the colonial heritage with many, many churches and beautiful buildings. On the other hand tremendous dirt and pollution caused by mining activities and horrible traffic. The engines of the cars smoke heavily due to lack of oxygen in this altitude. Also we had some trouble with our car: First we had again bubble in the brakes. We selected a street car workshop and they did an excellent job. 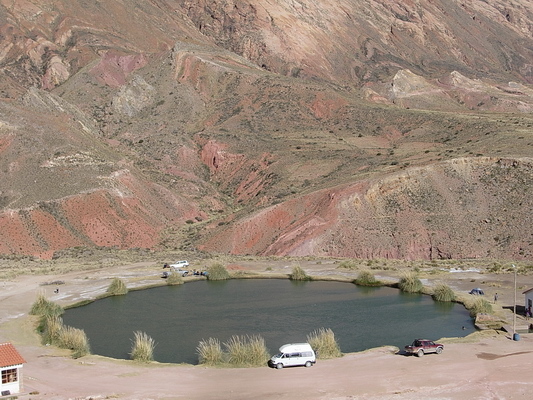 Close to Potosi is the marvelous Laguna Tarapaya, a circular crater lake with approximately 50 meters diameter and pleasant warm water of about 30°C, where we stayed several nights (GPS coordinates: S19° 28.029' W65° 47.686'). It was a pleasure to swim in the warm water. Sometimes it tickled a little bit because there were some gas bubbles. Our car had smoked like a volcano on the way to the lake; thus we decided to return to Potosi to our street car shop to check and adjust the engine. They disassembled the motor and revised the five heater plugs. 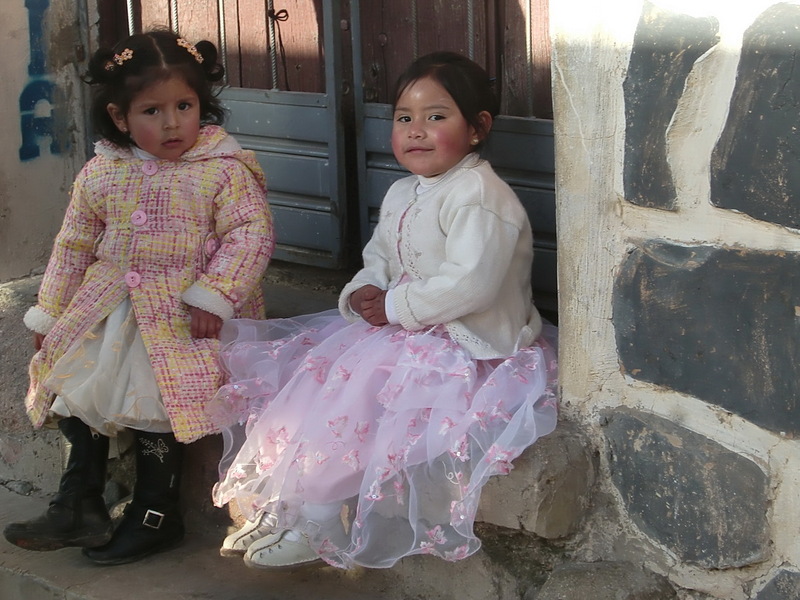 But they needed a lot of time; consequently we were forced to stay the night on one of Potosi's main street. Finally they fixed everything till lunch time and we returned to the Laguna Tarapaya, where we met Sandy and Carlos from Australia. We enjoyed this wonderful place two days again. On the highest and windy point between Potosi and La Paz we detected that we lose some diesel. There was a significant spoor on the road after us. Alfred disassembled the engine and detected the hose to the fifth cylinder not fixed. After correction the motor worked properly. But Alfred was very dirty: All clothes he was wearing were more or less garbage! When we came to the outskirts of La Paz in the late afternoon of June 11th 2011, we had outstanding views to the peaks of the Cordillera Real, the royal mountains. We needed to fill up our gas bottle and we had an address in these outskirts of La Paz. There was a huge gas plant, but they refused to do the job. We continued to the Hotel Oberland (www.h-oberland.com), which is famous for its campground (GPS coordinates: S16° 34.072' W68° 05.351'). This hotel is managed by Walter from Switzerland and you feel immediately like being in Europe, for instance you can eat Rösti or cheese fondue. And we met Sandy and Carlos again and we emptied some bottles of good Bolivian red wine together. Walter explained us that we have to use another full bottle to fill our gas bottle. We have to turn the full bottle to the head that the liquid flows into our bottle. But we need special adapters and we should go into the city to purchase them. There is the Santa Cruz Street with a lot of gas tool shops. We found the right adapter, a connector between the gas hose and the Bolivian gas bottle. But when we were back at the hotel Oberland we checked that there was no hole in the connector to the tube. Thus the gas could not flow into the hose, definitely a wrong part which cannot work. Fortunately Walter had a welding set, where we dismounted the needed connector. Finally we were able to fill our bottle approximately 60% with the bottle to bottle method. On the next day, Sunday we visited the Valle de Luna, the moon valley, which is close to the Hotel Oberland. This was our third Valle de Luna (after the Argentine and Chilean) and it is the greenest one. 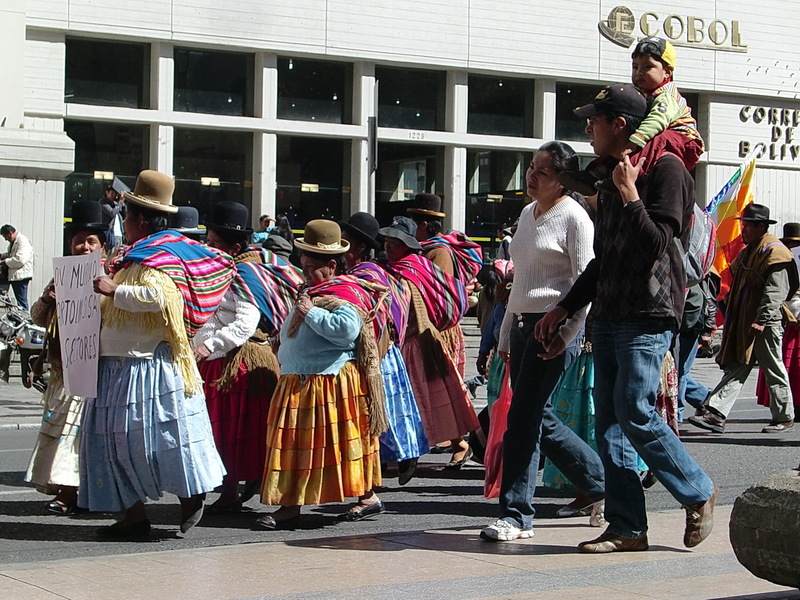 On the next day, Monday was a general strike in Bolivia. 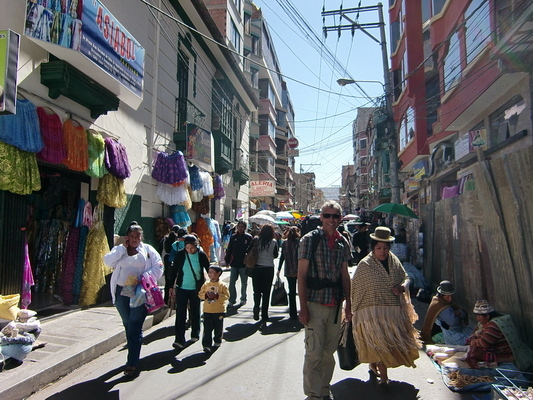 The streets of La Paz were deserted. We could not get a taxi to the city to purchase the right connector and to repair Walter's welding set. Instead we walked to the next valley, where a lot of fancy houses were or were in construction. A rich quarter of La Paz and many Geocaches according to the La Paz section of www.geocaching.com! But Geocaching in La Paz is a painful pleasure: Either there are in the dirtiest garbage or in the steepest mud walls, where the access is extremely dangerous. We just found two. 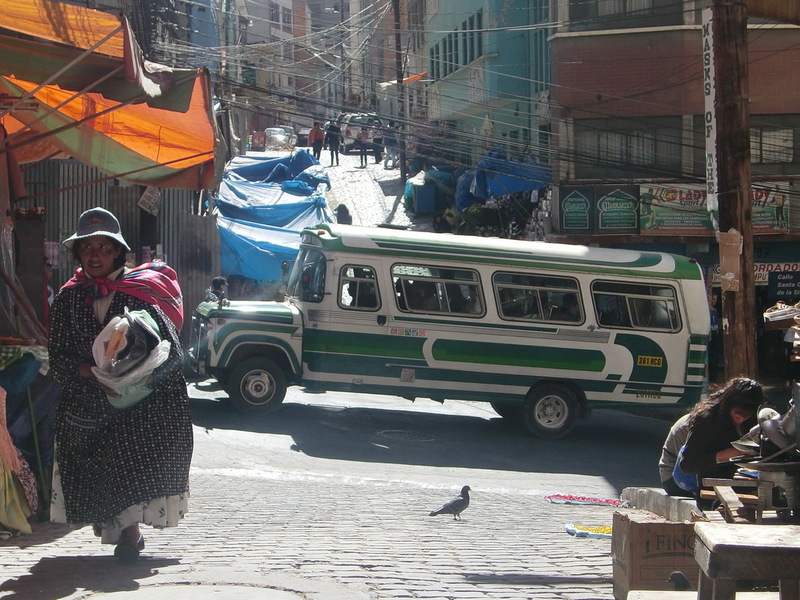 Tuesday life in La Paz was as usual. We took a taxi to the hill Monticulo close to the center, where you have stunning views to the city. Finally we got the right part for our gas adapter and for Walter's welding set. The next day we started our trip to the Cordillera Real and to the Yungas. 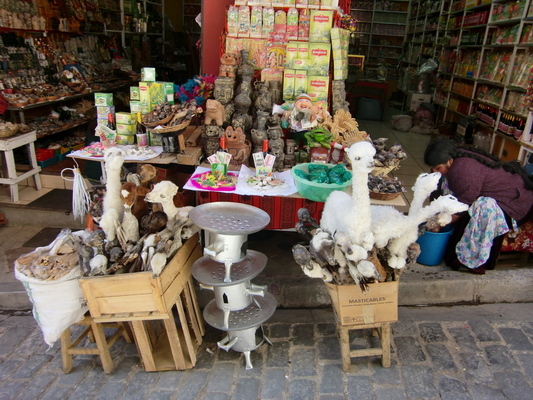 We came back to La Paz in the evening of June 22nd. 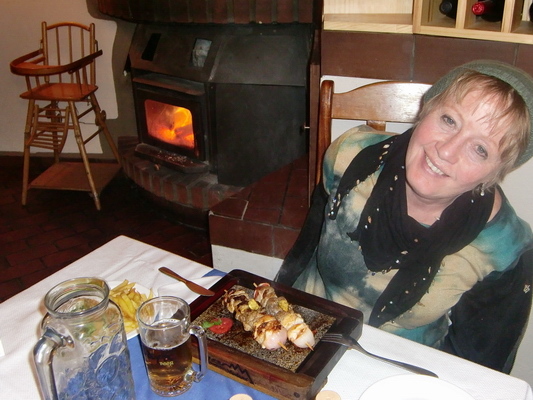 We met Karin and Reinhold from Bavaria in the Hotel Oberland and we had a lot of fun together. We went shopping together and we purchased a lot.